Its hard to trust God when life doesn’t make sense. It certainly must have been for Abraham. One day God says to him, “take your son, your only son Isaac, whom you love, and go to the land of Moriah, and offer him there as a burnt offering on one of the mountains of which I shall tell you” (Genesis 22:2). I find this story one of the most gripping passages in the whole Bible. I remember reading Soren Kierkegaard’s four imaginative re-tellings of it at the beginning of Fear and Trembling in college and for the first time starting to understand the story’s difficulty and significance. It brings us to our knees before God in His unbending Lordship and demands our full obedience as the only appropriate response to who He is. Why didn’t life make sense for Abraham? 1) Child-sacrifice is immoral. I don’t see how to get around this one. Some commentators try to downplay it by claiming that child sacrifice was common in this time and the law had not been given yet. But can we really see Abraham’s conscience not speaking against the slaying of a child? I wrote a paper for a class on Existentialism in college entitled, “What’s the Difference Between Abraham and a Terrorist?” Its a meaningful question to ask because there are some ways in which Abraham and terrorists are alike – for example, they both believe God commands them to kill the innocent. There are differences, too, of course – but the difficulty remains. Put it like this: the book of Kings repeatedly condemns child sacrifice, so how can God command here what he abhors elsewhere? 2) Isaac was the child of promise, the one through whom all of God’s covenantal promises to Abraham and plans for redeeming the world would be realized. This was not just any child being sacrificed – this was the apparent undoing of everything God had done and promised in Abraham’s life. Isaac had been born of a miracle five chapters earlier – and now God was going to undo his own miracle? Unmake his own promises? Thwart his own plans? Crazy. 3) Abraham loved Isaac (22:2), who was, as the text continually highlights, his only son (22:2, 12, 15). And God’s commandment in 22:2 is not given with any reasons: Abraham is simply commanded to do it. He’s not even told exactly which mountain to go to – its left up to further revelation (“on one of the mountains of which I shall tell you”). Think of the anguish in a father’s heart at such a difficult command, given without any explanation or reason. Think of all the questions he would have asked himself: “should I tell Isaac before I kill him? What will Sarah say when I get back without him?” Abraham must have died a thousand internal deaths of anguish and confusion with every step closer towards Moriah. Yet Abraham obeyed. And what’s amazing is, the New Testament holds this very episode up as an example of the necessity of obedience in our own lives (James 2:20-23). Gulp. The whole narrative is set up by the heading, “God tested Abraham” (Genesis 22:1). What was being tested, specifically? Whether or not Abraham was a God-fearer: “now I know that you fear God, seeing you have not withheld your son, your only son, from me” (22:12). The whole passage is about what faith really is. What faith does. How faith acts. Even when pulverized into the dust by impossible requirements. The passage is telling us: obedience is the testing point for faith. As Kierkegaard and Luther protested, faith is not an easy, tame thing: it is the highest and greatest passion of which a human is capable. Where there is faith, there is obedience. Where there is disobedience, there is a lack of faith. 1) God’s sovereignty can never be an excuse for disobedience. What’s interesting is that everything promised here to Abraham in response to his obedience (22:16-18) has already been promised to him (Genesis 12, 15, 17). And yet the divinely ordained means for accomplishing those promises was the very thing which looked as though it would kill them. We can’t pull the God’s sovereignty card: “Lord, I will obey you in area x, because I understand how that fits together with your sovereign plan – but I won’t obey you in area y, because I don’t understand how that fits in.” What if Abraham had said that? 2) Obedience is where blessing is. “Because you have done this … I will bless you” (22:16-17). 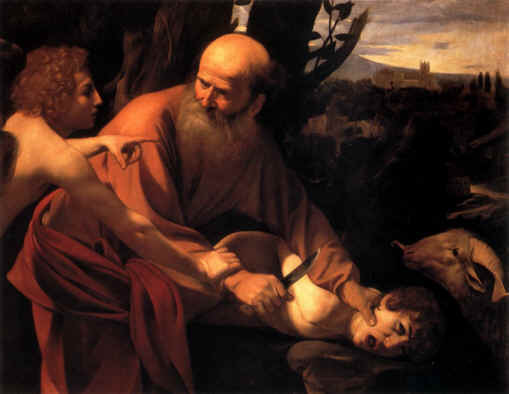 When Abraham raised up that knife, he must have felt as though he was killing God’s blessing, since that blessing was promised to come through Isaac. What was really happening? Just the opposite: “because you have done this … I will bless you.” When we takes steps of obedience into a dark place, it may look and feel like its the end of hope, but in reality its the only place where true hope really is. 3) Salvation comes from God. At the ultimate testing point of Abraham’s obedience, God intervened. Rather than demanding that Abraham go through with the sacrifice, God provided a substitute. Without claiming to know exactly what was on the original human author’s mind at this point, I do think its appropriate to step back, look at the whole of Scripture, which ultimately has one author, and note the parallels between Genesis 22 and the gospel. There was another Father whose heart was grieved has he handed over his Son to death. There was another mountain on which the Lord provided (22:14). There was another sacrifice that was made as a substitute. And when Jesus Christ hung on the cross for our sins, there was no one to stay the Father’s hand. Jesus got what Isaac didn’t. Because of the cross, we can live with hope amidst our struggles with obedience, knowing that God’s wrath has already been exhausted, and knowing that if he’s already done this, surely he will finish the job started in us. The cross also helps us trust that God’s heart is good – and when we trust God’s heart, we will find ourselves able to obey. I originally titled this post “Trusting God when ….” Then I changed it to “Obeying God when….” Finally I changed it to: “trusting/obeying when …” because the more I reflected, the more it seemed to me that trust and obedience are really two sides of the same coin. If we trust Him – really trust His heart – we’ll obey. I am preaching on Jonah this weekend and I plan to touch on a bunch of this. Sometimes God’s call – his orders – the hand we are dealt, they seem impossible and unreasonable. How could God…? Why would God….? And yet, we are given two options. Do we trust in our sovereign God as Abraham OR do we run from his Word and authority. I have been thinking about Abraham and Isaac a great deal as Grant and I walk through our journey, and it was God that I stumbled upon your blog for such a time as this. Reading here has been an encouragement. Thanks for sharing! God worded it this way?